The times, they are a-changin.’ Americans’ love affair with road trips has existed since before Bob Dylan first sang those words in 1964. But thanks to increased environmental awareness and rapidly developing technology, the way we take these road trips is beginning to shift, as we begin to invest more and more in electric vehicles as a country. Thankfully, you can now take a cross-country road trip that passes through more than 35 states in an electric vehicle. 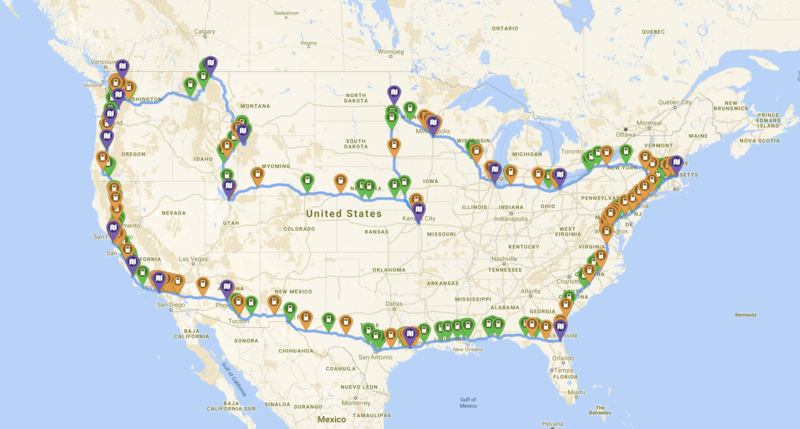 We’re calling this trip “The most epic (-ally sustainable) American road trip. The route allows you to circumnavigate the continental US and take in a number of top attractions and major cities along the way, all without hitting the gas pump. Before hitting the road, let’s cover some basic knowledge about travel with electric vehicles. First of all, it’s important to note that there are now over 15,000 electric vehicle charging stations in the United States. Here is a map of all of them. That said, there are more than 150,000 gas stations, and it takes significantly less time to fill up a gas tank than it does to charge a battery. It’s still much tougher to travel in an EV but hey — progress is progress. Bloomberg even brought forward the idea that autonomously driven electric vehicles could shift the entire structure and economy of the traditional road trip, exploring what happens to highway shopping centers and truck stops when passengers no longer need to stop for gas. One concept author Conor Sen brings to light is that those commercial centers could become obsolete, replaced instead by the humble highway rest stop which already offers restrooms and is likely soon to be equipped with EV charging stations. You can even charge your car while you sleep throughout much of the journey. Hotel chains such as Marriott and Best Western are leading the charge towards more sustainable road tripping by having EV charging stations available at many of their locations across the country. According to technology publication Arstechnica, 199,826 electric vehicles were sold in the US last year. The increasing adoption of EV vehicles and the infrastructure needed to keep them running is likely to make this map completely obsolete in less than five years. For now, though, stock up your cooler with refillable water bottles and grab your recycled polyester Patagonia jacket because it’s time to hit the road. 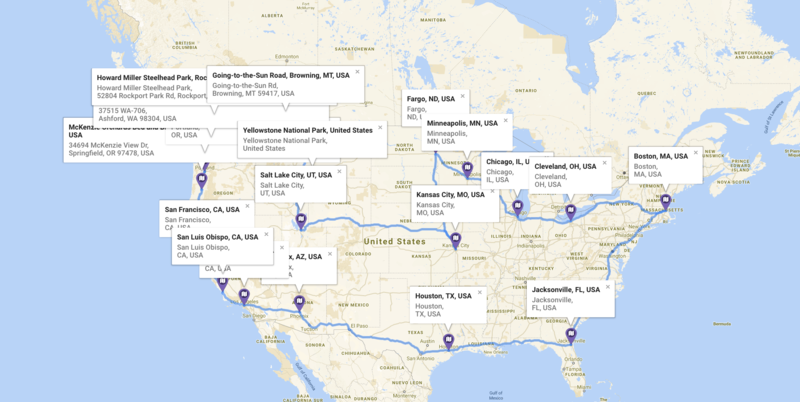 To plan our road trip, I used an incredible site called PlugShare. Here, you can map out a trip around EV charging stations. You can even locate hotels that let you charge your car while you sleep (Bob Dylan wasn’t lying). Their new ‘Trip Planner’ feature is great, although there are a few kinks that need to be worked out by the site. Still, the ability to route a cross-country road trip in an electric vehicle in under an hour is an exciting development. The idea of our trip is to see as much of the country as possible on one continuous journey. This trip is built around the average distance that 8 of the top 2017 model electric vehicles can go without a charge, which is about 121 miles. In a few cases, we have distances stretching to 140 miles. Tesla’s 2017 Model S can go 338 miles on a single charge, but I omitted that and the Tesla Model X from the calculation because they’re significantly more expensive than the other cars on the list. The slightly more affordable options hover around the 100-mile range, with many falling between 100 and 150 miles per charge. This trip requires 9,770 miles of driving, but guess what — you’re not going to have to stop for any oil changes. The total drive time is 151 hours and 50 minutes, not including any detours to check out the sites. The route offers dozens of hotel options with EV charging stations. Throughout much of the country, there is at least one per every 12 hours of driving. When the need to shower or that urge to go to town on a continental breakfast hits, you can be doubly productive. The route passes through or near a number of National Parks and Monuments, as well as campgrounds for overnight stays. There are a total of 250 charging stations along the way. This map shows each of the anchor stops along the way that were used to route the trip. This map shows the route with EV charging stations. The green pins represent high-powered charging stations. Orange pins are regular charge stations, and the purple pins are the anchor stops. Anchor stop 7: Experience downtown Salt Lake City, Utah’s unique culture. Anchor stop 8: Marvel at the Rocky Mountains through Colorado and into Kansas, taking in some blues in Kansas City. Anchor stop 11: Cruise through Madison, Wisconsin on your way to Chicago. Be sure to check out the famous Bean in Millenium Park. Anchor stop 13: Pass through the beautiful Finger Lakes Wine Region and central New York on your way to Boston. Anchor stop 14: Take your time and eat your way through the South. You can take a couple beach detours along way if necessary, and eventually find yourself in Jacksonville. Anchor stop 15: Head over to Houston and check out their new “bean.” Compare to the one in Chicago. Anchor stop 17: Then push through to Los Angeles to see how the rich and famous (and struggling art students) live. Anchor stop 18: Head up the jaw-dropping Pacific coast through San Luis Obispo. Anchor stop 19: San Francisco, where it all began. Raise a toast! This is one heck of a journey. If you take it, be sure snap plenty pictures because we want to hear the story. The coolest thing about this map is that in one year, it might look completely different. You might be able to add a number of new stops and maybe even take it north to Canada — or across the pond to Europe. Both regions have growing EV infrastructure. Exciting times lie ahead as you’re able to drastically reduce the footprint of your travels.